Jynessa Brosier is a Dietitian/Nutritionist and Wellness Coach at Rebekah’s Health and Nutrition Source, Grand Blanc, Michigan. Before joining the team at Rebekah’s, Jynessa attended Michigan State University (MSU) where she studied and mastered nutritional science and graduated with a Bachelor of Science in Dietetics. After graduation, she completed her Dietetic Internship in the Greater Detroit Area where she traveled between different hospitals, clinics, and government nutritional programs. She worked closely with clients and patients of all ages to assess, diagnose, and treat dietary and nutritional problems at an individual level. Jynessa has always had a passion for nutrition and health since a young age. After working closely with the public in the medical and health field, her passion has only grown after seeing first hand how nutritional intervention can change a person’s life. Creating meal plans and educating the public about the importance of nutrition and wellness is one of her favorite things to do! 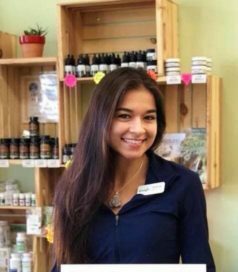 Jynessa feels extremely blessed to be part of the family at Rebekah’s and to be able to continue to do what she loves every day; to help people find true health and wellness through nutritional, holistic approaches.